A walk through today’s electronics emporiums, hotel rooms, and sports bars, as well as through a vast number of living rooms, reveals that we’re well on our way to reflecting reality in high definition. Broadcast television is going completely digital; HD movie downloads are becoming more common; and the large, analog cathode-ray tube TVs of old are about as relevant as the Model T. Given our increasingly high-def landscape, is it time to consider an HD camcorder? In a word, yes. Prices for these camcorders have dropped precipitously—you can now put HD in your pocket for less than $200. Recent Macs have enough horsepower to edit the huge files these cameras can generate. And with each passing day, it’s easier to share the results of your work—in much of its HD glory—with the rest of the world. (Check out our latest camcorder reviews). 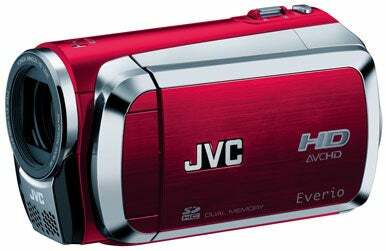 The JVC Everio GZ-HM200 offers a 20x optical zoom, along with a splash of color and the ability to record consecutively on two SDHC cards. Lens Full-size camcorders (as opposed to pocket camcorders such as the Flip MinoHD and Kodak Zi6) have lenses with optical zoom—the kind of zoom controlled by movement of the lens elements. All today’s full-size consumer camcorders have at least a 10x optical zoom. The image you get from an optical zoom is as crisp and clear as the lens can make it. In addition to optical zoom, these camcorders offer digital zoom that extends the reach of the optical zoom. (You could, for example, have a camcorder with a 15x optical zoom and a 180x digital zoom.) Digital zoom enlarges the image by making pixels larger, which leads to softer video (similar to scaling up an image in Adobe Photoshop). Sensor At one time, digital camcorders contained CCD (charge-coupled device) sensors—imaging sensors that work in tandem with a separate processor to convert images to digital information. Most of today’s camcorders use CMOS (complementary metal-oxide semiconductor) sensors. CMOS chips are less expensive, require less power, and can be made smaller than CCD chips. A sensor’s size and makeup can make a difference to your video. The larger a sensor is, the better its low-light performance is likely to be (so you’ll see less grain in video captured in low-light conditions). Also, the more pixel elements a sensor has (and the larger they are), the sharper the image usually is. LCD Many modern full-size camcorders sport touch-screen LCDs you use not only to view your video but also to access a camcorder’s many recording and playback features. (Pocket camcorders have far smaller displays, and they have buttons rather than touch-screen controls.) On some camcorders, the LCD also acts as the sole viewfinder. Storage Most full-size camcorders provide either tape-based or tapeless storage. And the way a camera stores its data hints at the kind of video format it uses. Although tape is on its way out as a storage medium in HD camcorders, manufacturers including Canon, Sony, and JVC still make some tape-based cameras. These cameras shoot in the HDV (high-definition video) format, which uses the MPEG-2 compression codec, and they usually record onto standard MiniDV tapes. Video from HDV camcorders looks great, and tapes can be convenient for archival purposes. The disadvantages of tape are that your shooting time is limited—a tape holds an hour of video—and unlike with tapeless camcorders, you don’t have instant access to individual clips. Instead, you have to wind through the tape to find the clip you want. Also, you have to capture footage from the tape in real time: if you shoot for an hour, it will take at least an hour to transfer all the footage to your computer. Tapeless camcorders store their data on hard drives, flash memory chips, MiniDVD discs, or removable memory cards (and some cameras use multiple media). These cameras use the AVCHD (Advanced Video Codec High Definition) format—a high-definition format that uses the MPEG-4 AVC/H.264 codec. Some people still prefer the archival quality of MiniDV tapes, even on an HD camcorder such as the Canon Vixia HV40. When you import these AVCHD files into iMovie ’09 (or Final Cut Express or iMovie ’08, if you prefer), they are converted to the Apple Intermediate Codec (AIC) because iMovie can’t work natively with AVCHD footage. This conversion causes the file size to balloon—a 150MB AVCHD 1080i file converted to AIC weighs in at around 1.1GB. These AIC files consume a lot of storage space on your Mac, and editing them requires a fair amount of processing power—you need an Intel-based Core Duo processor or better. With the help of a video-conversion utility, you can convert AVCHD to a file format other than AIC, and you may be able to work with that converted file on a PowerPC Mac or a slower Intel Mac (we’ll have more on this later). Camcorders that house a hard drive tend to be more expensive and bulkier than those that store data on flash media or media cards. The advantage of a camcorder with a 60GB or larger hard drive is that it can record for long periods of time. (You can get camcorders with hard drives that hold as much as 120GB.) For example, if you’re shooting a day’s worth of presentations and don’t want to miss a second to swap in new media, an AVCHD camcorder with a hard drive is a good choice. The disadvantage is that when the drive gets full, and if the camcorder doesn’t offer another storage option (a media card, for instance), you must either delete some of the data on the drive or connect the camcorder to a computer and archive the video, which can take time that you don’t have to spare. Pocket camcorders act like USB key drives—connect one to your Mac, and it will appear on the desktop as a removable hard drive. These cameras store video either as H.264 MPEG-4 files (for instance, the Flip MinoHD, Kodak Zi6) or H.264 AVI files (the Creative Labs Vado HD). Resolution and frame rate When looking at HD camcorders, you’ll see a variety of numbers followed by an i or a p—1,080i and 720p, for example. These figures indicate the HD video mode: the number of horizontal pixels and the display format. Specifically, 1,080 video offers a resolution of 1,920 (vertical) by 1,080 (horizontal) pixels; 720 video offers 1,280 (vertical) by 720 (horizontal) pixels. The i and p stand for interlaced and progressive, respectively. Traditional video is made up of odd and even lines (or fields). With interlaced video, each video frame is displayed in alternate fields, horizontal lines that are painted on the screen from top to bottom. So in the case of 1,080i, the 540 odd fields of one-pixel rows are displayed first, followed by the 540 even rows. Progressive video (often called Full High Definition Video by manufacturers) draws every line, from top to bottom, in one pass. The goal is to produce 30 frames per second (or darned close to it). Camcorders that shoot 1080i do this by shooting 59.94 interlaced, odd and even frames per second. This is termed 60i. 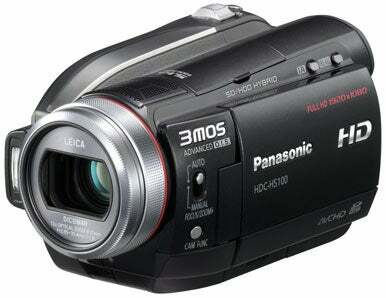 1080p camcorders shoot 30 (30p) progressive frames per second. Some camcorders can optionally shoot 24p video—24 frames of progressive video per second. Because 24 fps is the standard used in motion pictures, shooting at this rate on a camcorder gives the video a more cinematic look. And because the shutter speed is lower (so more light can touch the sensor), 24p also gives you better low-light video. Additionally, video shot at 24p contains fewer frames and therefore consumes less storage space. 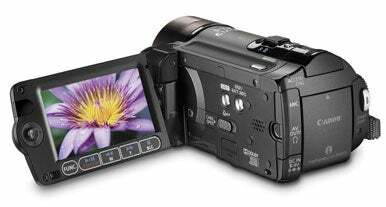 The Canon Vixia HF11, like the other Canon camcorders included here, shoots 1080p video in both 24p and 30p modes. Progressive video looks cleaner than interlaced video, particularly when there’s a lot of movement in the image. You’re less likely to notice the difference between interlaced and progressive video on a television because TVs are designed to account for interlaced video—they either support interlacing natively (standard-definition TVs) or include deinterlacing circuitry (HDTVs) that converts interlaced video to progressive video. Computer monitors, which are progressive-scan devices, don’t include deinterlacing, which is why interlaced video can look jagged on them. For this reason, it’s important to consider where your video will eventually appear. If that’s a TV, either interlaced or progressive video will do. If your video is likelier to appear on computer screens, progressive is the better choice. Midpriced full-size camcorders typically shoot in 1080i, whereas more-expensive camcorders offer 1080p video (and some offer additional shooting modes such as 24p). Pocket camcorders, however, shoot only in standard definition or 720p. Bit rate Bit rate describes the amount of information stored in a unit of time. For example, HDV, which uses the MPEG-2 encoder, offers a maximum bit rate of 25 Mbps (megabits, or millions of bits, per second). AVCHD, which uses the H.264 encoder, maxes out at 24 Mbps. The higher the bit rate, the better the video should look. You can’t compare the bit rates of different encoders, as each encoder has its own way of processing video. For example, H.264 is a more efficient encoder than MPEG-2, so it produces better-looking video at lower bit rates. 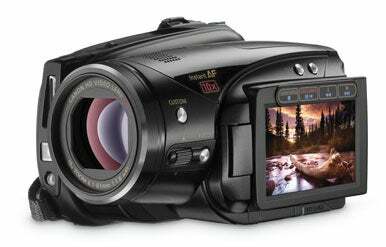 When comparing camcorders, you can compare the bit rates of two AVCHD camcorders, for instance, but not of an AVCHD and an HDV camcorder. Media transfer Today’s camcorders routinely transfer data via a USB 2.0 connection. This is good news for people with one of the most-recent MacBook models, which lack a FireWire port. Unlike full-size camcorders, which include mini-USB ports, pocket camcorders have full-size USB connectors. A push of a button usually releases the connector so it’s ready to plug into a USB 2.0 port. For cameras that use removable media—an SD card, for example—you can optionally eject the media from the camera and plug it into a card reader attached to your Mac. Inputs and outputs In addition to a USB port, HD camcorders can include a variety of other ports for moving audio and video in and out of the camera. Mini-HDMI ports for connecting the camera to an HDTV or an HD receiver are commonly found on full-size HD camcorders. You might also find an AV-out port that lets you send component analog video to an analog device such as a TV set, a video recorder, or a video-capture card. Many full-size camcorders also include microphone and headphone ports. Most HD camcorders, including Panasonic's HDC-HS100, use optical image stabilization to reduce the shakiness of handheld video. Still capture Full-size camcorders can also take still images, just like a digital camera (some can do this while you’re shooting). Cameras will rate their still-image capabilities by the number of megapixels captured—3.0 megapixels, for example. While having the ability to capture still images is nice, it’s not these cameras’ strongest feature and therefore shouldn’t be a major factor in your buying decision. Most of today’s point-and-shoot cameras will produce better-looking pictures than a camcorder (and camcorders usually produce better looking videos than still cameras with video functionality, although there is a new crop of still cameras that can shoot HD video). Of the pocket camcorders, only the Kodak Zi6 captures still images. Manual control While camcorders are normally operated as point-and-shoot devices, there will be times when you want greater control over exposure and focus—for example, if you’re shooting on a bright sunny day and want the camera to compensate with a more sympathetic white balance, or if you’re shooting in low light and the camera’s autofocus doesn’t track your subject as well as you’d like. The ability to select a white-balance setting, adjust exposure, and manually control focus is handy. The more expensive a full-size camcorder is, the greater manual control you’re likely to get. Pocket camcorders truly are point-and-shoot and offer no exposure or focus controls.